An emerging therapeutic strategy may help keep muscles stronger longer in ALS. The antibody-based approach, which boosts the activity of the muscle-specific tyrosine kinase MuSK, aims to help keep muscle fibers and motor neurons stay connected by stabilizing neuromuscular junctions (NMJs). The preclinical study, led by New York University School of Medicine’s Steve Burden found that the potential treatment, when delivered after symptom onset (P90), preserved NMJs in SOD1 G93A ALS model mice at least 50 days after the first signs of the disease. What’s more, the approach reduced spinal motor neuron loss by up to 57% (at P138) and resulted in a moderate yet significant increase in survival time. The strategy builds on previous studies from Burden’s team, which found that increasing the activity of MuSK, by overexpressing the enzyme, reduced muscle decline and improved motor function in the same mouse model of the disease (see Pérez-García and Burden, 2012). The approach, originally developed by Genentech in San Francisco, CA, is one of growing number of strategies that aims to keep motor neurons and muscle fibers connected by stabilizing neuromuscular junctions (NMJ) (see February 2018 news; Cantor et al., 2017; Miyoshi et al., 2017; Young and Fallon, 2012). The study is published on February 20 in Elife. Meanwhile, in Canada, researchers are taking a different approach. The small-molecule, known as pimozide, aims to stabilize NMJs by helping to transmit electrical signals from the motor neurons to muscles that signal muscles to move (see February 2018 news). The medication is currently being used, in part, to reduce motor and vocal “tics” in people with Tourette’s syndrome. A phase 2 clinical trial is ongoing. Stay tuned. To learn more about this approach and others targeting the NMJ in the ALS pipeline, check out Meeting ALS At The Junction. Cantor S, Zhang W, Delestrée N, Remédio L, Mentis GZ, Burden SJ. Preserving neuromuscular synapses in ALS by stimulating MuSK with a therapeutic agonist antibody. Elife. 2018 Feb 20;7. [PubMed]. Pérez-García MJ, Burden SJ. 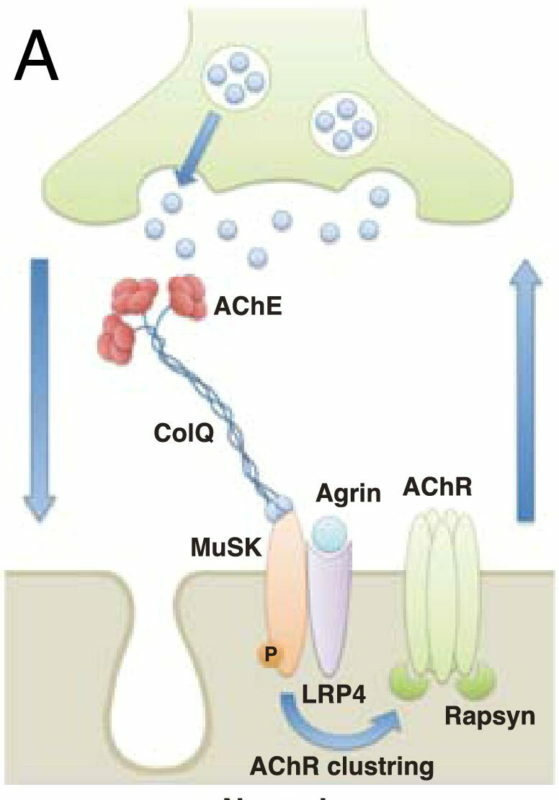 Increasing MuSK activity delays denervation and improves motor function in ALS mice. Cell Rep. 2012 Sep 27;2(3):497-502. [PubMed]. Patten SA, Aggad D, Martinez J, Tremblay E, Petrillo J, Armstrong GA, La Fontaine A, Maios C, Liao M, Ciura S, Wen XY, Rafuse V, Ichida J, Zinman L, Julien JP, Kabashi E, Robitaille R, Korngut L, Parker JA, Drapeau P. Neuroleptics as therapeutic compounds stabilizing neuromuscular transmission in amyotrophic lateral sclerosis. JCI Insight. 2017 Nov 16;2(22). [PubMed]. Miyoshi S, Tezuka T, Arimura S, Tomono T, Okada T, Yamanashi Y. DOK7 gene therapy enhances motor activity and life span in ALS model mice. EMBO Mol Med. 2017 Jul;9(7):880-889. [PubMed]. Young MF, Fallon JR. Biglycan: a promising new therapeutic for neuromuscular and musculoskeletal diseases. Curr Opin Genet Dev. 2012 Aug;22(4):398-400. [PubMed].